Publication of the King James translation of the Bible was a milestone in making the Bible more accessible to the general population in England. After an uncertain start, this translation became a best seller for almost 400 years, with billions sold and, due to its popularity was known as the “Authorized” or “Common” version. No other version has achieved such popularity, praise, and love. What is it about this version that has enabled it to endure? An examination of the translation process and its circumstances yields some clues to answer this question. When James I ascended to the English throne in 1603, the time of William Shakespeare and Francis Bacon, the country was very involved with the things of God and the Church. As reigning monarch, James was head of the Church of England, England’s official Protestant Church. Everyone was required by law to attend Church each week or pay a fine. King James was an extremely scholarly man, the only English monarch ever to publish a book of his own works. He was also an ambitious man and a shrewd politician. His vision for England was that of a peaceful and balanced society. However, the Puritans and the Bishops were great rivals in the Church and James needed to find a way to bind them together to avoid their stirring up discontent. After the conference of Hampton Court, the Puritans had suggested the idea of a new translation of the Bible. (None of the three existing Bibles, –the Calvinistic Protestant Geneva Bible, Queen Elizabeth I’s Bishops Bible, and the Roman Catholic Latin Vulgate Bible, –suited James.) James knew that compromise was the only solution and that neither the Puritans nor the Bishops could be excluded from the translation process. Sanctioning a new translation of the Bible, true to the original texts, –to the Word, which appeals to the mind, and would move the Church away from ceremony, which appeals to the senses, –seemed a promising proposition. Ever the politician, James placed the work under the control of the Bishops, but allowed input from the Puritans. One goal of the new translation was to connect the reader directly with the meaning of a message recorded in ancient languages, generally unknown to the reader. The translators took their work very seriously, sometimes debating at length over a single word. There was a commitment of total fidelity to the original languages, but also to total transmission of the depth of meaning to the reader. To maintain this purity and his other goals, James instituted a set of 15 rules governing the translation process. According to these rules, marginal notes and commentary (to explain some of the more ambiguous passages or words for which there was no equivalent English word,) were forbidden. Translators inevitably exhibit bias, and marginal notes -if printed in the translated document- will reflect that bias to the reader, thereby effectively forming a barrier between him and the original text, and inhibiting individual interpretation. The “no marginal notes” rule had the effect of forcing the translators to find the words or phrases that could convey the multiplicity of meanings of the original. Annotations, found in the margins of some of the original source works used in the translation process, indicate some of the alternative words the translators had considered using. Other notes show the great ingenuity of the translators in their use of phrasing and judicious punctuation to get closer to the original, and to preserve ambiguity. Ambiguity arose because there were some cases where the translators admitted that they simply did not know what was meant by the original. This visible ambiguity in the King James Version is sometimes criticized, but actually it has great value. Ambiguity, by allowing for multiple meanings, requires the reader to be an active thinker, not just a passive reader, and also demands that he take upon himself the responsibility for interpretation. Ambiguity in meaning, when worked with and pondered, gives the reader the opportunity to grow in his understanding of complex ideas, so that increasingly he grasps the higher and deeper meanings which at first reading maybe he didn’t see, or wasn’t ready to understand. The translators were also conscious that the Bible was to be read aloud in Church, and that therefore the way the text sounded when read aloud was important. In considering which words to use, they looked for sounds of greatness and chose words to try to convey a sense of the divine, so that the people would realize that they were in fact hearing the Word of God. They knew the text must flow and wanted the words to sound like music to the ear when read. 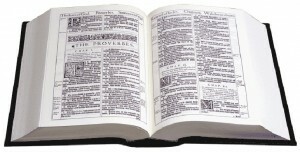 The translation process was completed in 1611, but the new Bible at first met with universal loathing. Puritans thought the translation too “high church,” too formal. After the death of King James and the murder of his son, England descended into civil war, and the King James Version of the Bible was left to gather dust for some 30 years. But after the Civil War, in 1660, people seemed ready to embrace the new translation as part of a renewal and a fresh start. The King James Bible came to prominence as a link to the past, specially prepared for the Church of England. Phrases borrowed from it have become part of the very fabric of the English language. 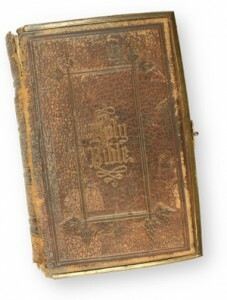 The King James Bible has been described as the most influential book in the English language. Through the work of missionaries, it has been carried to every corner of the English-speaking world. What will a modern day reader look for when choosing a translation of a classical text written thousands of years ago? Could he be satisfied knowing that highly educated, cultured scholars undertook the translation? Could he accept the use of ambiguity as a means to draw attention to passages with a multiplicity of meaning? Will he want to make sure that the translation conveys the greatness of divinity through the beauty of expression? He probably will. The King James Version will likely have an audience for some time to come.